November 13, 2018 will be remembered for a long time. Why you ask? because once again, Christie’s has delivered and broke records. Sales for the famous auction that took place in Geneva totalled CHF 110,211,750 or $109,439,653 (according to the official 1.0107055 exchange rate that day). During the same auction last year, Christie’s had a total of CHF 105,422,500 or $106,519,652 (according to the official 0.98970 exchange rate on November 14, 2017. This represents a 4.54% increase year over year (based on official CHF sales figures). This year, the top lot took in CHF 50,375,000 , while in 2017, the top lot took in CHF 33,500,000 which represents a 31.77% of total sales. In 2017, there were 12 items sold over CHF 1 million (which accounted for 81.6% of sales), while this year it was 13 items (which accounted for 68.6% of sales). It took five and a half minutes for just a handful of bidders to raise their hands, and eventually only a single one was victorious; that of the famous Harry Winston representative sitting in the first row, right in front of Rahul Kadakia. 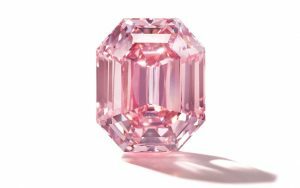 The 18.96 carat, Fancy Vivid Pink Diamond was sold for CHF 50,375,000 ( $49,871,250 million and was renamed The Winston Pink Legacy. It joins a handful of significant diamonds in the “Legacy Diamond Collection” currently owned by Harry Winston. Some of the other “Legacy” diamonds are “The Winston Blue Diamond”, a 13.22 carat, Fancy Vivid Blue Diamond, which was purchased for a then world record price of $23.8 million, back in May 2014 in Geneva. 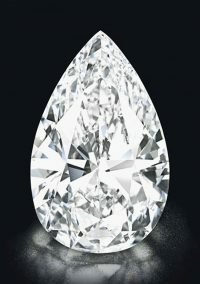 The other is the 101.73 carat, “Winston Colorless Legacy”, which was acquired only a year earlier, also in Geneva for $26.7 million, which was also a world record for a colorless diamond at that time. 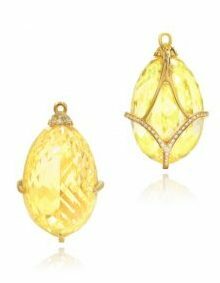 The 81.40 carat, Fancy Intense Yellow in a briolette shape was sold for $2,863,575 or $35.2k per carat, after an estimate of $1.8 million to $2.5 million. 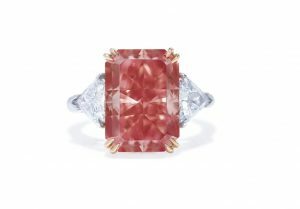 The 8.25 carat, Fancy deep Orangy Pink Diamond was sold for $3,695,175 or $448k per carat, after an estimate of between $2.7 million to $3.5 million. 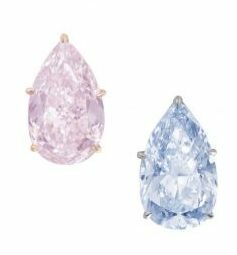 The 8.85 carat Fancy Blue with the 8.79 carat, Fancy orangy Pink diamond earrings were sold for a total of $4,645,575 after an estimate of between $4 million to $6 million. The pair was sold during a Sotheby’s auction in May 2016 in Geneva for a total of $5,989,523 prompting a 22.4% reduction in price. 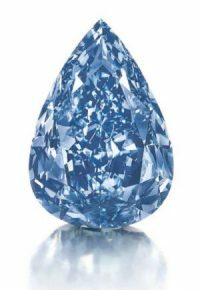 If we look at current market value of Fancy Blue diamonds, which is valued at $350k to $500k, it puts the Fancy Blue diamond at a value between $3.1 million to $4.4 million. 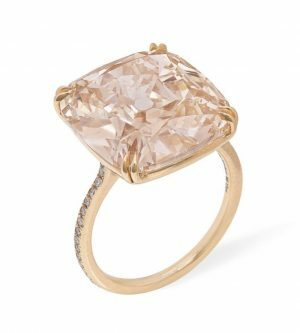 The Fancy Orangy Pink, being valued at about half of its pure form of Fancy Pink, is valued at between $150k to $225k per carat, which is $1.3 million to $2 million. In total, the value of both is between $4.4 million to $6.4 million on the market today. The only conclusion that I see here is that the current owner acquired it on the lower end of the market valuation, while the old owner, may have needed the quick liquidity of the asset, and may have overpaid for the pair two and a half years ago. The word overpaid is used here since the old owner did not hold it for long enough to create value. We have to remember that when we decide to invest in Fancy Color Diamonds, the minimum holding period recommended should be no less than 5 years, and even 10 years would be needed in order to create an above average rate of return when taking the level of risk/reward for such real assets. A 12.04 carat, Light Pinkish Brown diamond with a VS1 clarity was estimated to sell between $240k to $320k in total and ended up selling for $666k total or $55.3k per carat, representing a 110% premium to the high value given by the auction house. The 7.58 carat, Fancy Bluish Green diamond with a VS1 clarity did not sell. It was valued at between $1 million to $1.5 million. The bidding started at $700,000 and the highest bid was $950,000, but failed to sell when it did not meet the minimum reserve set by the seller. It was quite a night for the audience, the sellers and buyers. New world records set by the new “Winston Pink legacy Diamond”. It now holds the world title of highest per carat price paid for any pink diamond at auction which is $2.63 million per carat. The old record was $2.175 million per carat held by the 14.93 carat, Pink Promise.